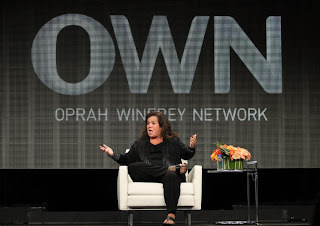 Rosie O'Donnell is coming back to TV on the OWN network...yay (eye roll). She is currently out on the media circuit trying to amp up some buzz around her show. You may remember when she had her old she (the Rosie O'Donnell Show...not The View) she had this giant obsession with Tom Cruise. Which is pretty hilarious since she went crazy and so did Tom. Now that she is back Nightline asked her if she is still obsessed with T Cruise? Nope, Tome Cruise is out and...Russell Brand is in. What the hell....ok, but if you think about it that makes sense. Rosie is a lezzy and Brand does have a lot of feminine attributes. Not looking forward to the return of Rosie, but I am even more unexcited for Rosanne's new show which was just picked up by NBC. Gross. I blame all of this nonsense on Jersey Shore.